Well here they are, the spy photos of the new team DAS Pro Street bike. The creation of owner Eric Paquette, this P/St. 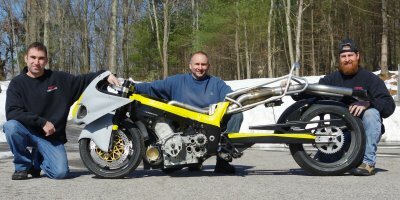 bike is the second in a series of Pro Street bikes for MIROCK competition conceived by Eric who is the tuner and mastermind behind DAS Performance. Three fourths of Team DAS are seen here, L-R, Tony Ficher of Falmouth Mass, Eric Paquette of Danvers Mass, and Mike Zerofski of Lowell, Mass. Missing from this photo is Mark Godin of G&G Engineering, Lawrence, Mass. Tom McCarthy photo. 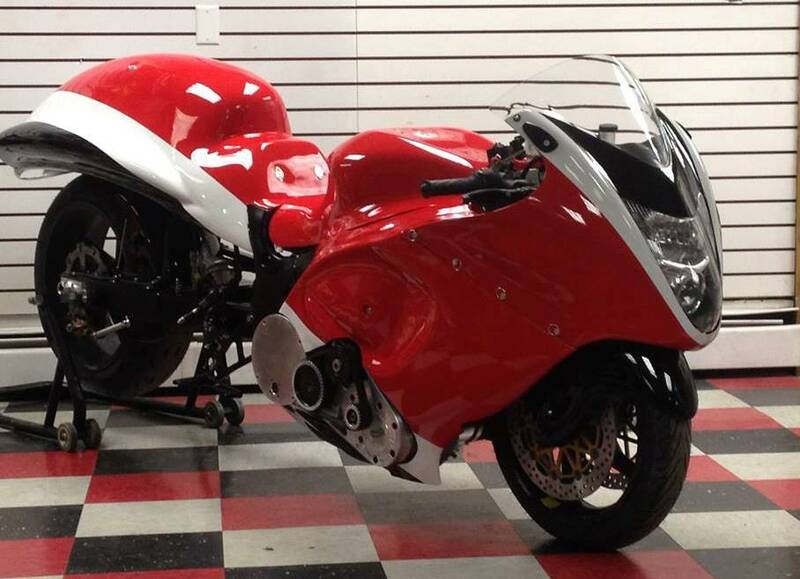 Eric’s previous P/St bike was the quickest of it’s kind as a supercharged Hayabusa with a run of 6.90 produced during MIROCK racing series action in 2013. The machine was piloted by fellow Massachusetts native Tony Ficher, of Falmouth, Ma., and the team performed well throughout the year, finishing the season 4th in points behind class winner Joey Gladstone. The team did extremely well, considering this class sees close to fifty entries at some events. In 2013, the team raced in six of seven events with MIROCK. The New DAS bike in fresh paint will look exactly like the previous edition from the outside except the hidden exhaust system. DAS team photo. After the USA racing season concluded in 2013, Eric was contacted by Team DRAG 965 from overseas. Team owner Mohammad Al Sabah, sought to purchase the world’s quickest Pro Street supercharged drag bike and a deal was struck sending the first Team DAS bike to the Arabian Peninsula. Eric’s original creation now thunders down the track in Qatar, piloted by Yaqouab Alali. As 2013 came to a close, Eric spent much of his winter months delivering his Pro Street bike to Qatar, then flew over to help the new team with the tune-up. During this time frame, Eric ordered new components to create the second generation of his famous race bike. It’s getting a bit crowded under the DAS bike body work. This system took a ton of forethought to produce and hide the components from view, yet retain functionality. DAS team photo. It took from January to April of 2014 for Eric and his team to create the Gen II edition of the DAS Pro Street bike and it’s now ready for track testing. 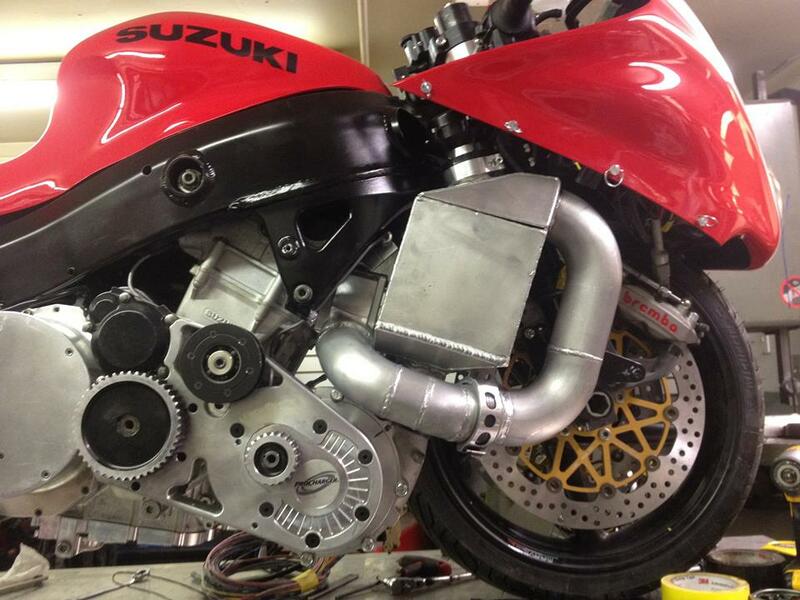 Like the machine before it, this bike is outfitted with a ProCharger, belt driven supercharger. 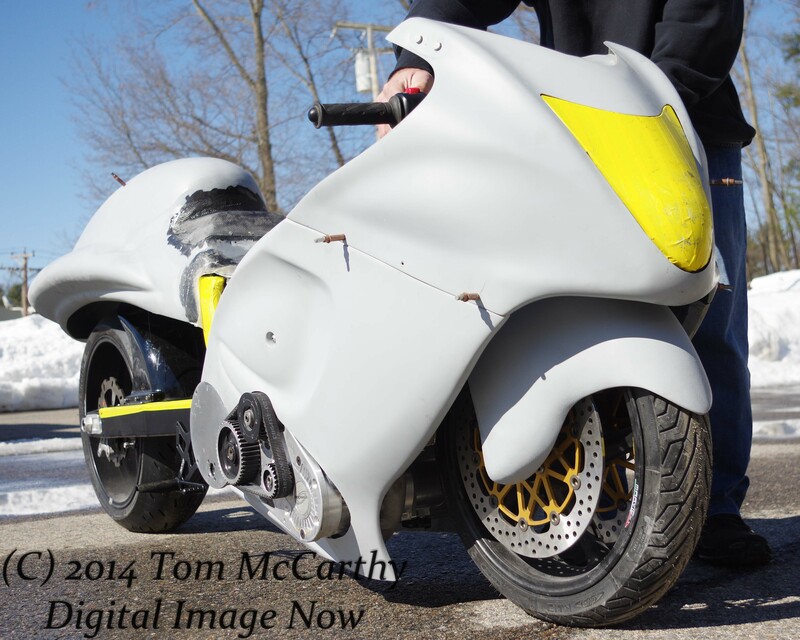 Eric’s first P/St bike had a best elapsed time of 6.90 seconds and a top recorded speed of 212mph. In September of 2013, when Ficher clocked the six-nine-oh elapsed time, that was the second quickest run of all time by a Pro Street bike. One can only wonder how much faster and quicker this new bike will be once Team DAS sorts it out. The exhaust system is a one of a kind four into two, into one collector that finally splits into two once again, exiting the left and right side of the bike. The sound is different from anything else you’ve ever heard from a Pro Street bike! Tom McCarthy photo. You won’t notice it at first glance but once you’ve gone all around the bike you’ll find something’s not quite right about the new machine. There’s no exhaust megaphone on either side of the bike. You’re eyes are not deceiving you. There is no megaphone exhaust at all on this bike. The pipes now exit the body adjacent to the left and right turn signals of the body work through special cut outs. This bike is a head-turner in more ways than one. There are many changes you will not readily see on the new machine. The long low profile of the Pro Street bike has not changed, but the ProCharger unit seen on the right side of the bike gives away it’s evil nature. Tom McCarthy photo. commented Eric Paquette in a recent interview. 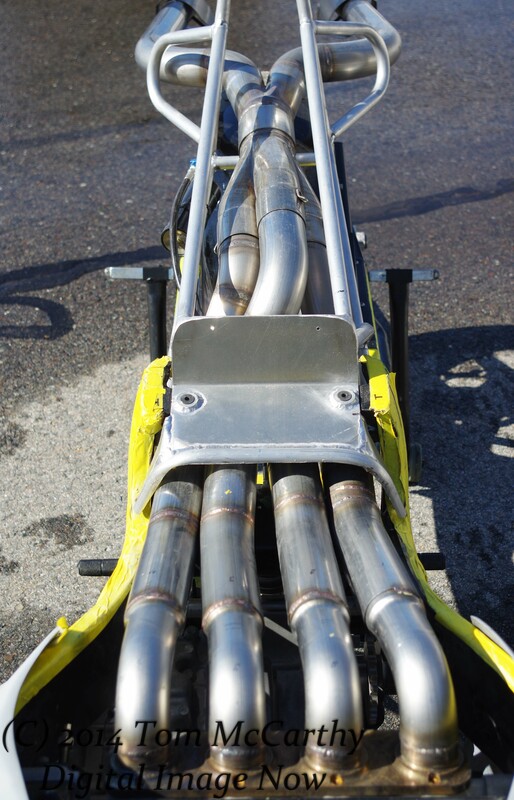 New England Dragway in Epping NH will likely be the test bed for the new machine. While local weather has still been on the cold side here in New England, temps are improving each week. Without question, Team DAS will be loading the trailer soon. Eric Paquette’s Team DAS consists of; driver Tony Ficher, hard working crew member Mike Zerofski, and machinist Mark Godin. Exhaust cutouts for the new DAS Pro Street bike can be found near the tail light area. Tom McCarthy photo. That is a sick bike!